Poynt is a free multimedia local search service that can be used all over North America. 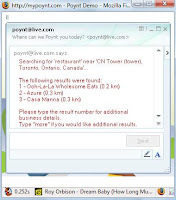 You simply add poynt@live.com as a contact to your Windows Live Messenger or poynt on your AOL Instant Messenger and away you go. Once you have specified your search location, you can enter keywords for the businesses and services you need (like pizza or movies) and the results are returned, with those closest to your specified search location listed first. With the ability to display all kinds of media, like movie trailers, and rich mapping functions inside of Messenger, Poynt is a very useful and handy tool for getting a handle on whatever it is you’re looking for, no matter where you go. Poynt will be available across more platforms, including a BlackBerry application, expected to be available later in Q1 2008.